Purple Jasmine was tea that I received for free from JusTea because they offer free teas to people on their birthday when they sign up for their newsletter. Luckily, Purple Jasmine is tea that I haven’t tried yet so I was pleased to receive it in the mail. It came to me in a resealable bag that is paper on the outside and foil on the inside, which is nice for tea packaging because keeps out moisture, air, and light. This green tea blend smells just like a jasmine green tea, which is one of my favourite types of tea blends. It has a sweet floral fragrance that is familiar. 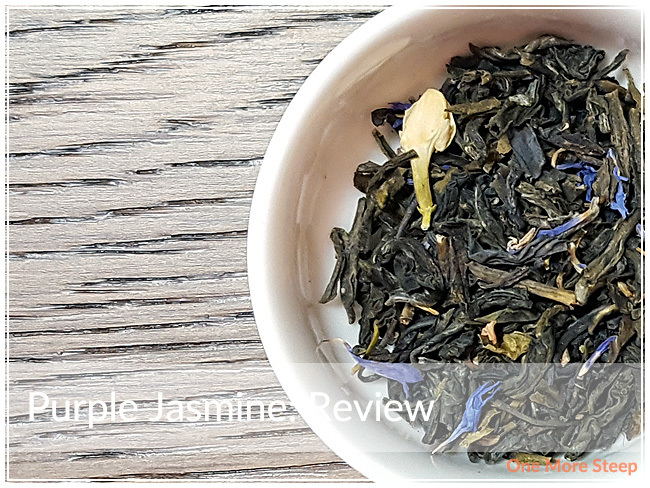 Purple Jasmine consists of jasmine green tea, Kenyan purple tea, jasmine blossoms, and cornflower blossoms. JusTea recommends steeping Purple Jasmine in near boiling water for 2 minutes. Their product page for Purple Jasmine suggests a temperature of 175°F (80°C), which is lower than “near boiling” in my books. Purple Jasmine steeps to a light golden yellow. This green tea blend has a bright floral aroma that instantly makes me think of jasmine flowers. I found that it has a sweet jasmine/floral taste, and there’s the subtle undertones of the green tea base. 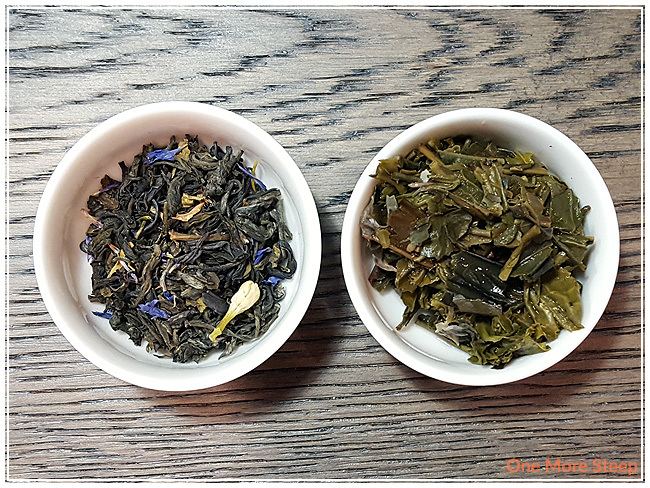 I noted some grassy notes that I attributed to the green tea base since the jasmine can be a bit overpowering in comparison. As it is a purple tea, I opted to add a little bit of lemon juice to my cup of tea. I found that the colour turned to a very light grapefruit-esque pink. However, I found that the lemon juice didn’t do much for the taste as it muddled the jasmine flavour. I much preferred it without the lemon juice. I resteeped Purple Jasmine twice. I found that the flavours were still quite strong for the first resteep, but found for the second that the sweet floral flavours were much more dilute. I would say that Purple Jasmine is good for one more steep. I loved JusTea’s Purple Jasmine. I really enjoyed this jasmine blend and how fragrant this tea was in both the dry leaf and the steeped tea. 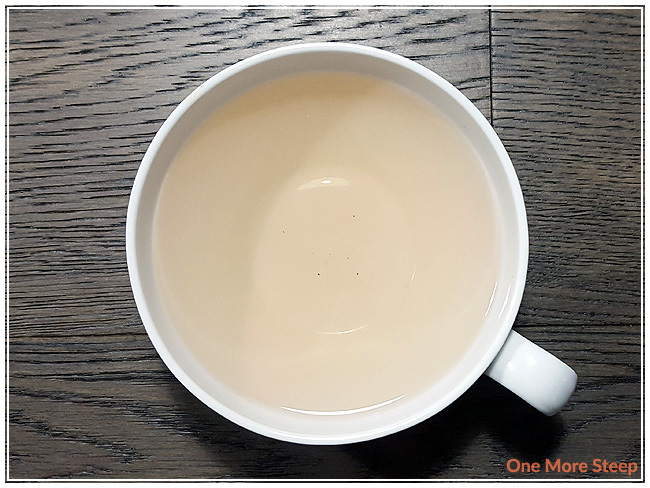 I wouldn’t recommend doing the colour change with the lemon juice unless you’re a fan of lemon in your tea, because I just don’t like what it does to the beautiful jasmine flavours in this tea blend. Because of the natural sweetness, I would pair this tea with a savoury breakfast to offset the heaviness in a hearty breakfast, or with any other meal to provide a contrast. 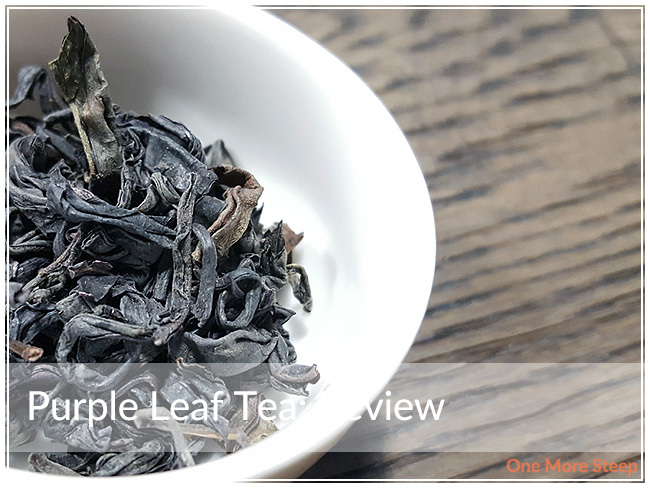 JusTea has provided me with Purple Leaf Tea for the purposes of providing an honest review. I received this product at no charge to me and received no other compensation. 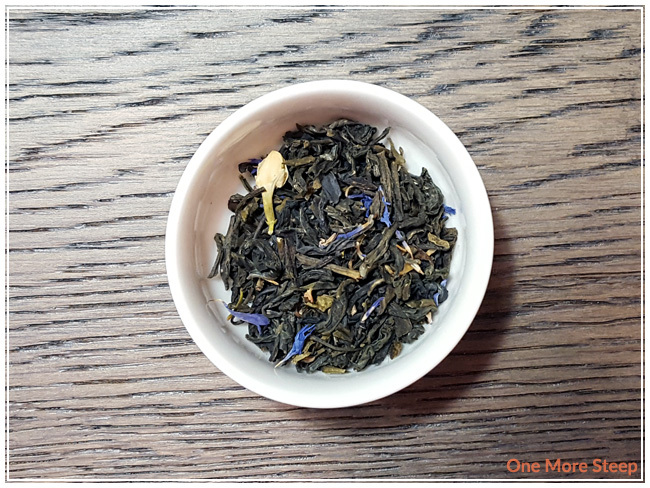 I wrote a bit about JusTea in my last review of one of their purple teas (Purple Mint). Purple tea is a variety of the same type of plant that the other teas that we all know and love (e.g. white, green, black, oolong) all come from. 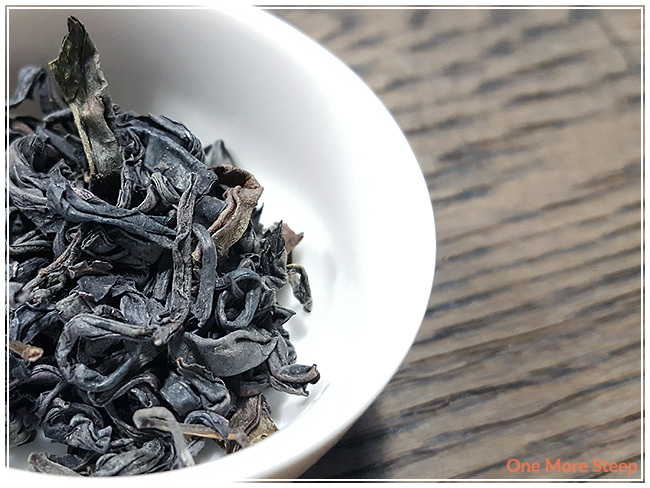 JusTea has a whole page dedicated to exploring purple tea and talks about the science behind this variety of tea, so be sure to check out their page for more information. 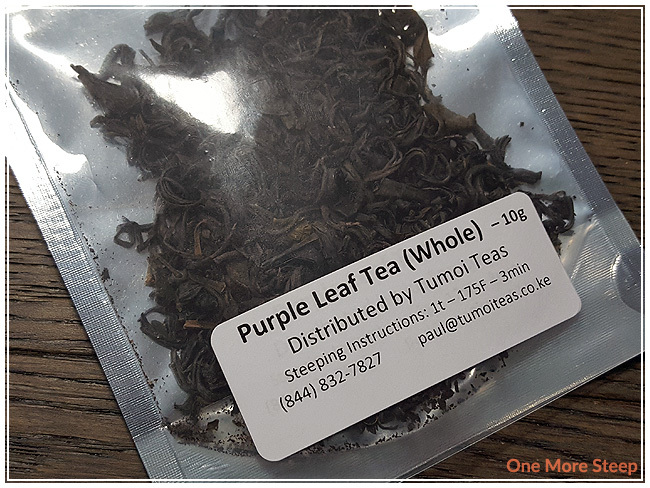 Purple Leaf Tea came to me in a sample bag, a bit different from the packaging that Purple Mint came to me in, although this one is nice too because I can see the tea leaves through the packaging and there were steeping instructions directly on the packaging. The tea leaves themselves are a bit wiry and they are quite dark. They have an almost dusty aubergine colour to them, almost a grey-purple or indigo in colour. There’s not a lot of smell to the dry leaves, there’s a very mild vegetal smell to them. JusTea recommends steeping Purple Leaf Tea in 175°F (~80°C) water for 3 minutes. I followed the steeping instructions to a tea (tea puns!). Purple Leaf Tea steeps to a nice yellow and there’s not much of a smell coming up from the steeped tea. 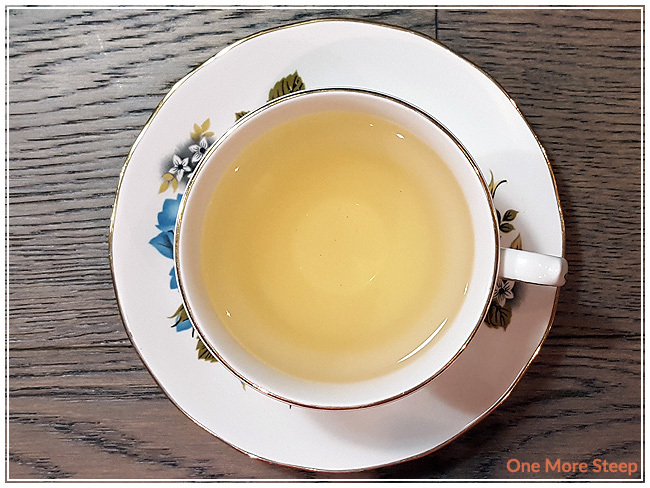 On first sip, I find that there’s a very mild vegetal taste to this tea and it also has a bit of a roasted flavour to it, almost like there’s a bit of a smokey quality to it – not to be confused with a lapsang souchong at all. The tea itself is savoury, there’s no sweetness that I can pick out from it. At the water temperature and the steeping time that I used (and what was recommended), there was zero astringency and bitterness to the tea. It reminds me of a very mild green tea with the mixed flavour profile of vegetables and smoke. The lemon brightens up the flavour of the tea, and actually makes the vegetal flavours more pronounced. The sourness of the lemon is tempered nicely with the smokey flavours in this tea (which I do appreciate). 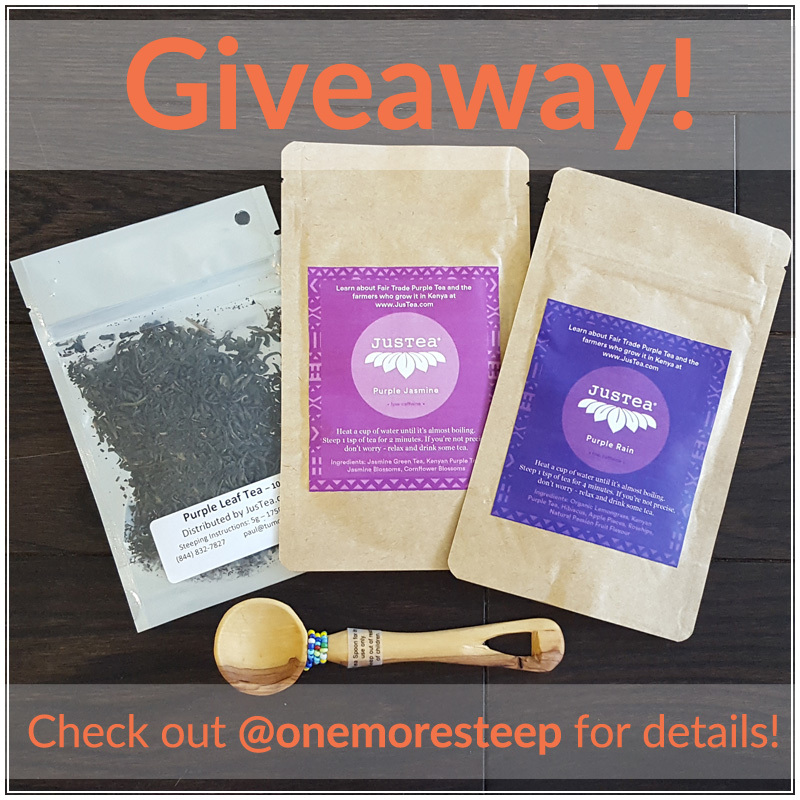 I resteeped Purple Leaf Tea twice. 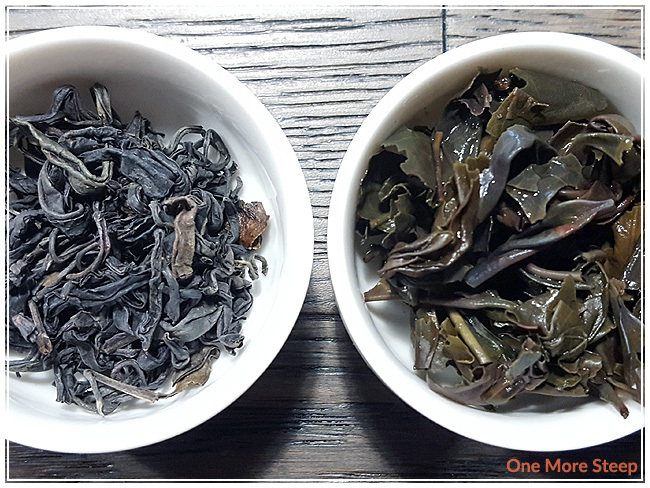 The flavour stays pretty consistent with the initial steep for the first resteep, but it begins to really lose flavour for the second resteep. I’d recommend only one more steep for this tea and I’m pleased to say that it continues to have the colour changing ability with each subsequent resteep. I loved JusTea’s Purple Leaf Tea. 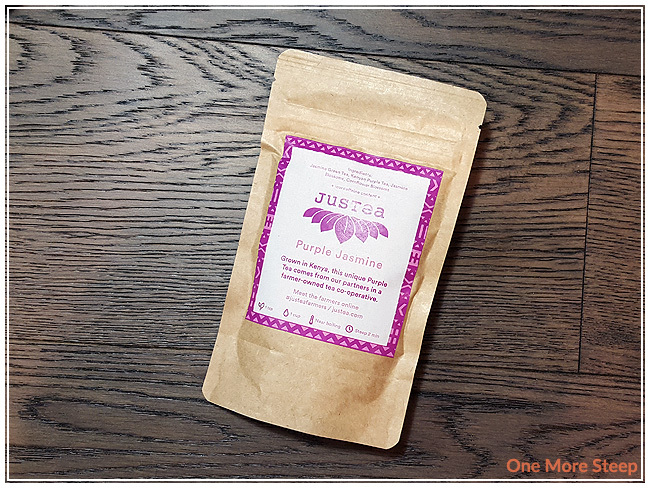 This tea has a mild savoury flavour to it, that I think lends itself well to being a base for a tea – which is why JusTea has come up with a range of purple tea blends. By itself, the flavour isn’t overly strong, and it reminds me a lot of a green tea (and I do love my green teas). The colour changing aspect works great with this straight tea, so it’s a fun feature if you’re wanting to host a tea party with some friends or children. I’m not usually one for lemon in my tea, but I think it works well for this tea varietal because it helps bring out the vegetal flavours and the smokey flavours tempers down the sourness from the lemon juice.